The Dennos Museum Center seeks to engage, entertain and enlighten its audiences through the collection of art, and the presentation of exhibitions and programs in the visual arts, sciences and performing arts. 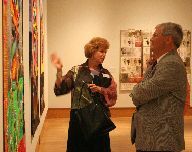 The Dennos Museum Center at Northwestern Michigan College is a premier cultural facility in northern Michigan offering a dynamic array of exhibitions and programs in the visual arts, sciences and performing arts. Opened in 1991, the Museum Center features three changing exhibit galleries and an elegant sculpture court; a unique hands-on Discovery Gallery and a renowned Inuit Art Gallery; and the acoustic delight of Milliken Auditorium. Visit the Museum Store for great museum shopping including a fine selection of Inuit art for collectors. The Museum's signature collection is Inuit art of the Canadian Arctic, one of the largest and most historically complete collections of these distinctive sculptures and prints in the United States. A significant collection of outdoor sculptures by noted international and Michigan artist surrounds the Museum on the beautiful campus of Northwestern Michigan College. In 2000, the Dennos Museum Center was recognized by ArtServe Michigan with the Governor's Award for Arts and Culture.